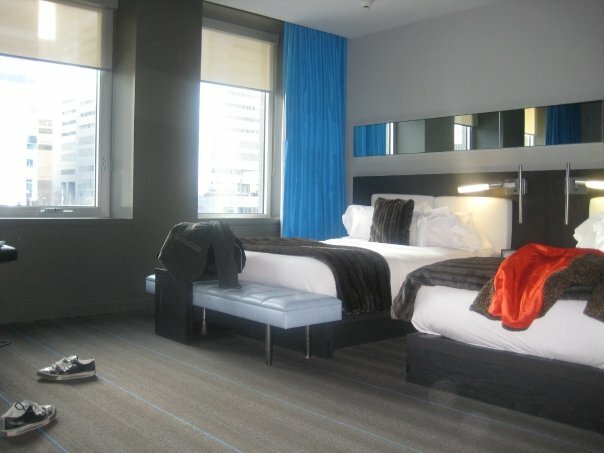 One of my favourite hotel chains is the W Hotel, and the hotel in Montreal is no exception. We stayed in the Wonderful Room which included a gorgeous tub and the colour scheme is very fitting for a winter stay! The W Hotel is uber-chic and super classy, it’s definitely a bit of a splurge but so worth it. 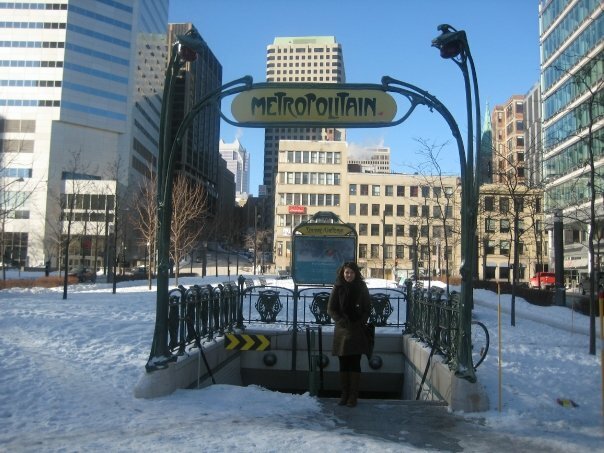 One of the things that always remind me of Paris are these Metro signs all over Montreal! The metro is the perfect way to get around the city, especially on freezing cold days. Otherwise, walking or biking is always a good option – it’s the best way to check out the sights! 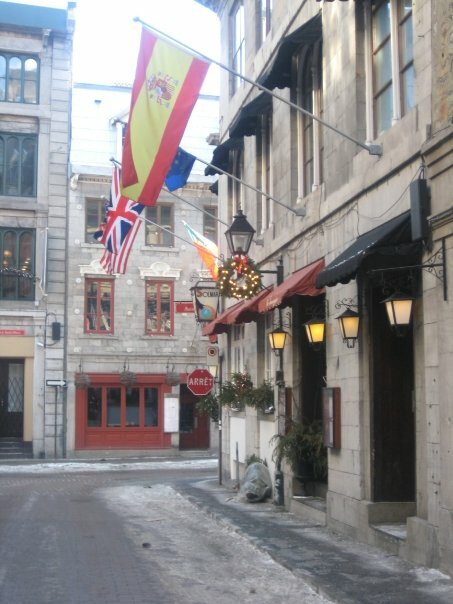 If you are walking down a street in Old Montreal and see one of these signs – stop inside. It’s a welcome relief from the bitter cold and it warms you up from the inside out. 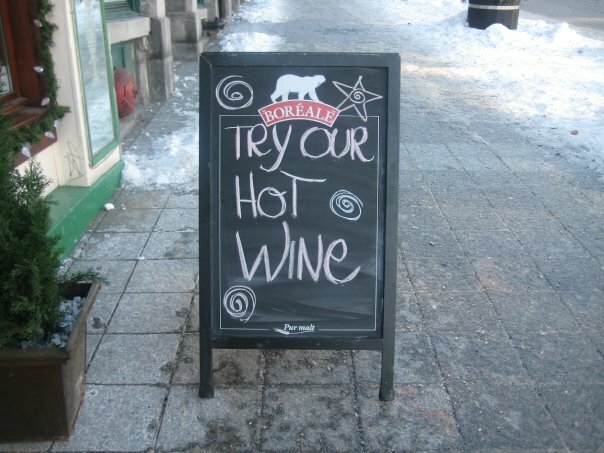 For those who haven’t had hot wine, it’s definitely an experience. It reminds me of mulled cider, but quite a bit different. 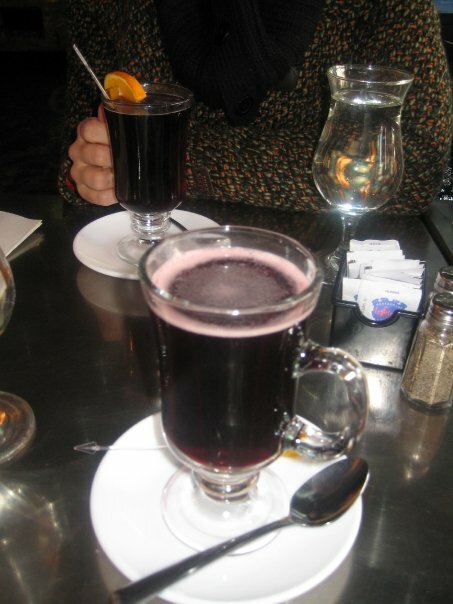 It definitely is perfect for a cold winter’s day, warming you up and getting you a little bit tipsy along the way. Old Montreal (Vieux-Montréal) is my favourite neighborhood, but there are many, many neighborhoods that make up the city, and they are almost all within walking distance. 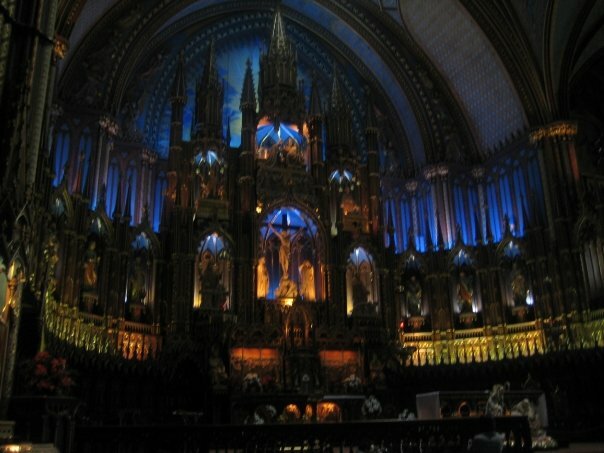 Everyone will tell you that you must see the Basilique Notre-Dame when you visit Montreal, it’s is pictured above (but very poor quality, sorry!). Now, I’m certainly not one to visit churches while vacationing – we do it simply because everyone tells us to or we’ll see a gorgeous building and of course it’s a church, but I spend a minute or two inside and I’m done. The Notre Dame is a bit different. It is breathtaking. The decor inside is unbelievable – it consists of carved gold, stained glass and gorgeous paintings. You can take a tour around the basilica with a guide, as well, but we just took a look around ourselves, standing in awe of it all. 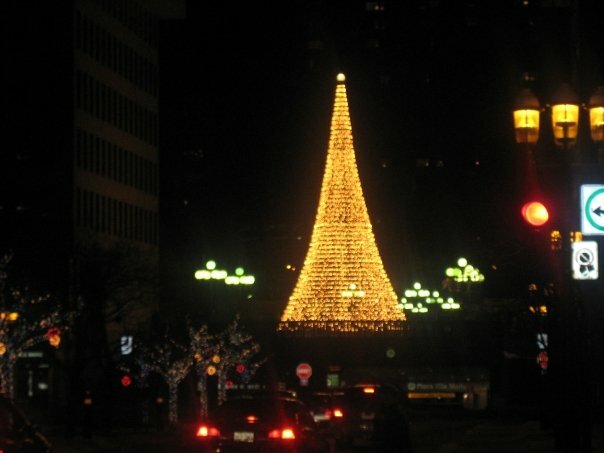 During this time of year the whole city is in lights! You can find Christmas trees in every neighborhood and my favourite way to check them all out is with a romantic horse-drawn carraige after dinner, bundled up in a blanket and listening to the horse’s hooves along the streets. It’s a tres romantique way to finish off a perfect Montreal day! Future plans, travels and anchors. I absolutely deplore writing about the future. Everything I hope and dream and plan for that I write down, means that I’ve actually put my eggs in that basket and that basket could be dropped with all the eggs broken at any moment. It happens all the time. I planned for Europe this summer and it didn’t happen. Life happened instead, which didn’t make my ‘future’ any less inviting, only different. I had wished to be in London or Paris or Bruges at this time. Instead I sit in my kitchen in my Vancouver condo, lighting candles and feeling a teensy bit like that woman with too many cats but convincing myself that at least I am enjoying my surroundings. The view is always gorgeous here at least. But it’s not Europe. Had things gone according to plan, we would probably visit Amsterdam and then Berlin as well, we would be drinking and eating and taking in culture – which is not to say that I am not drinking and eating here, discovering places around my city that I hadn’t even known existed before today. But it is not quite the same, is it? Our next plans were to go to Spain and Italy during January or February – visit the city of Madrid, lounge in Barcelona, party in Ibiza and then eat pizza in Naples, be romantic in Venice and discover every last corner of Rome until our feet, our hearts, and our souls were too tired for one last bite of spaghetti or one last kiss at one of those gorgeous fountains that seem to decorate every square of Rome. But I fear discussing future plans because I’m afraid that they won’t happen. I hate that. There are so many things I want to happen, but life gets in the way – and I shouldn’t complain because life is great. Life is full of wonder and mystery – it’s not like I”m struggling, I’m not unhappy, it’s quite the opposite in fact. I am overjoyed, every day brings upon adventure, British Columbia is full of natural beauty, friendly people, delicious foods and wondrous views. Every corner turned is a postcard. I feel a bit spoiled at times. I should never complain about the life I have, and I hope I don’t come off that way, but perhaps it’s just not what I pictured. It’s funny how life changes us, changes our ideals and wants into something unrecognizable yet surprisingly agreeable. Something that makes up happy that we never thought we wanted. I’m a traveller at heart, I love to be everywhere at once, yet for a while I wanted to find a place to call home – a place to rest. And now that I’ve found it, what? I want to be out and about everywhere else in the world? Life is strange at times. But to all those curious about what happened with my travel plans: life happened. Also, my camera is broken and we need to purchase a new one. Hence the lack of recipes – also, I’ve been baking up a storm, testing and re-testing cupcake recipes as I’ve decided to reopen my cupcake shop, Le Petit Cupcakery, and hopefully find a store front for it sooner than later. Which again would place my anchor deeper where I am than take me abroad somewhere, but perhaps that’s what I need for now. If you ever find yourself visiting the West Coast, then you must stop by Bowen Island – if only for the pizza. The island itself is a hidden gem, 30 minutes away from the downtown core but a natural paradise complete with pebble beaches, lush forests and even deer that provide perfect picture opportunities. Tuscany is owned by Christophe Langlois and Julie Cree, a husband and wife team with an extensive history in the art of food. The restaurant beckons you in from the street with its extensive front patio, which seems very private thanks to the shrubs and flowers that offer shade and beauty, twinkling lights and candles add to the romantic feel. Inside the restaurant will make you believe that you are somewhere in Europe – dim lighting, open kitchens, laughter and the smell of freshly baked pizzas and pasta! Be forewarned – this restaurant is perfect for a wine connoisseur and offers only four beers (in bottles), but does not have a full bar. Tuscany’s also offers specials which are not on the regular menu, and one ‘special’ that is offered every time I’ve been there is the grilled caesar salad. 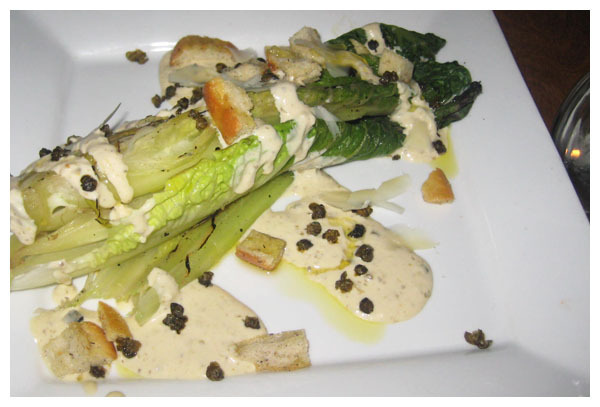 Not on the menu, but absolutely delicious, the lettuce is charred which gives it a somewhat smokey flavour while retaining most of the crunch in the romaine and wilting the edges. Their caesar dressing is housemade and addictive! The pizza itself is addictive as well – a thin crust but still strong enough to hold up the ingredients – and my favourite thing? 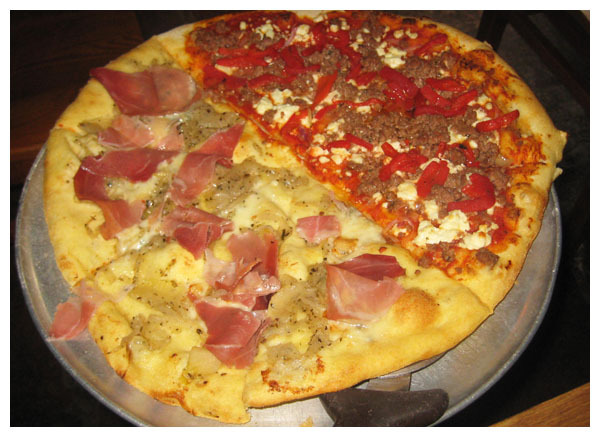 You can mix and match the pizza. Above we find the Amore (prosciutto, gorgonzola, caramelized onions) and the Bedouin (lamb merquez sausage, feta cheese, red peppers, red onion), both were amazing! Mister chose the Amore, which was perfection – the saltiness of the prosciutto mixed with the strong flavour of gorgonzola is ridiculously scrumptious. The Bedouin was my choice and satisfied my meat craving immediately. The feta was salty, the meat was rich and the roasted red peppers complemented everything perfectly. And there was not one but two pizzas that night! 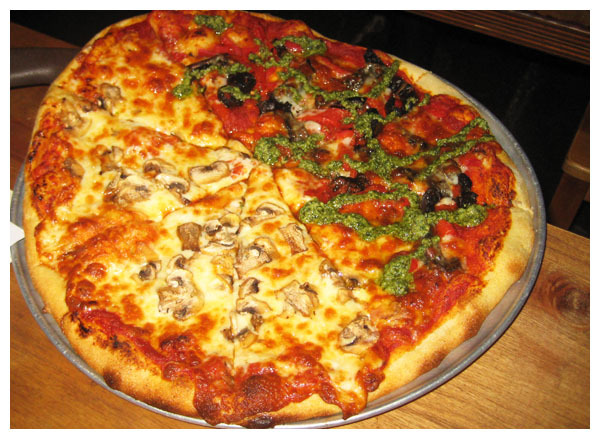 The one above is just a Baked Cheese pizza (mozzarella, cassata fruilano cheeses) with added mushrooms for Princess, and the Augustino, a new addition to the menu (portobello mushrooms, basil pesto, red peppers, tomatoes, cassata cheese), which was the most delicious vegetable-only pizza I’ve ever had. While the ‘kid-friendly’ pizza was reminiscent of any really good cheese pizza, the Augustino was absolutely to die for. Full of flavour and basil pesto that blew all of our minds, it’s definitely a great new addition to their menu – so new that the waitress hadn’t even heard of it! We always leave Tuscany Restaurant feeling satisfied and happy – and who wouldn’t be happy with bubbling cheese atop a crunchy and soft crust and topped with a perfect medley of vegetables and meat? 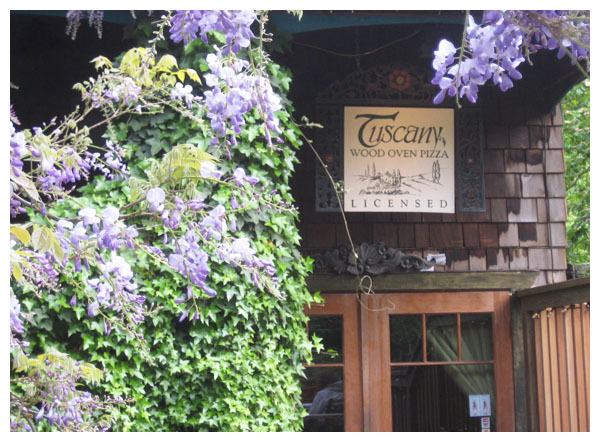 And if you find yourself on Bowen Island in the early morning stop by Artisan Eats, an extension of Tuscany Restaurant, offering delicious breakfasts, a raw salad bar, baked goods and specialty deli items. This evening, at approximately eight o’clock, I will be in the airport receiving area awaiting a tall long-haired brunette. She will assuredly be frazzled and tired and hopefully hungry. She is my sister. I haven’t seen her for almost a year. I moved in October and hadn’t seen her for a bit before then. The last picture of us together is old. I can’t wait for her to arrive! 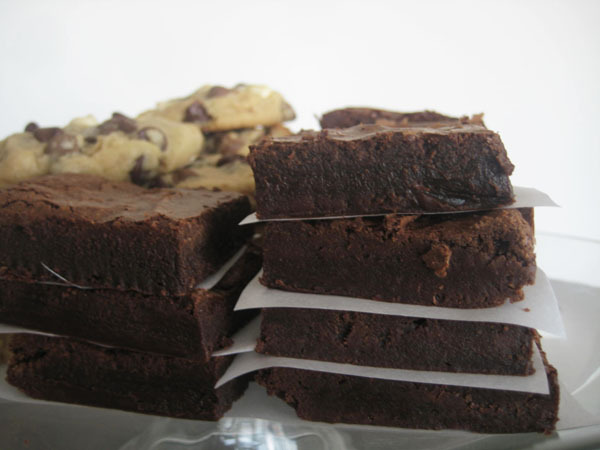 And in honour of her visit, I’m not only baking my signature triple-chocolate chip cookies, but these brownies as well. 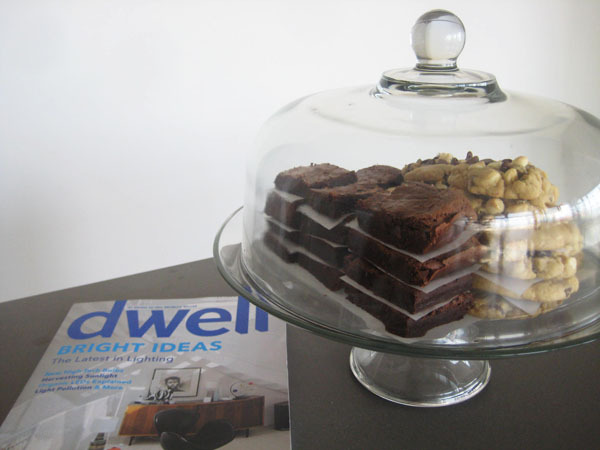 The brownies are delicious, further proving that David Lebovitz’s cookbook Ready for Dessert rocks. Every single recipe I make from it is a surefire winner – it gets bonus points from Mister who’s vice is anything chocolate, and these brownies really deliver a chocolatey goodness that nothing else compares to. Try to use the best chocolate to really get a sense of how delicious they are, but I admit sometimes I use the Baker’s brand from the grocery store and they still turn out amazing! I hope my sister enjoys them! 1 Preheat oven to 350°F / 175°C. Prepare 9-inch square pan with parchment paper or foil and lightly grease with butter or cooking spray. 2 In a medium saucepan on low heat, melt the butter and chocolate, stirring occasionally until melted and smooth. Remove from heat and stir in sugar and vanilla. Beat in the eggs one at a time. 3 Important: Add the flour and stir energetically for 1 full minute, until batter loses its graininess and becomes smooth and glossy. (I used a mixer.) Stir in any additions. 4 Scrape the batter into the prepared pan and bake until the centre feels almost set, about 28 – 30 minutes. Do not overbake. Let cool completely in pan before lifting the foil or parchment to remove the brownies. Optional Additions: 1 cup of toasted & chopped walnuts, almonds, hazelnuts or pecans. 1/3 cup of chopped dried cherries or cranberries. 1/3 cup of cocoa nibs. One tin of peppermint Altoids crushed. 1/2 teaspoon mint extract. 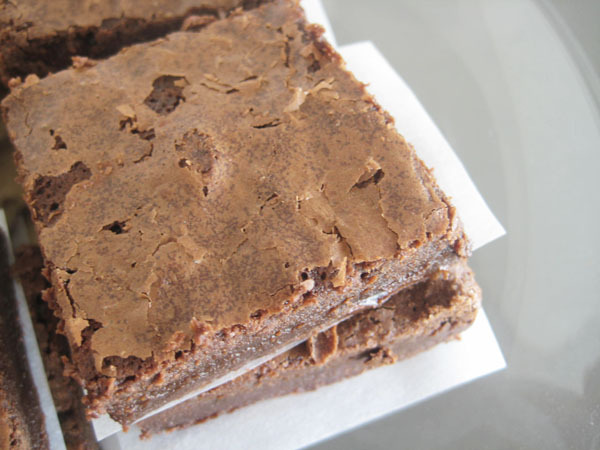 Perfect Edges: To cut the brownies perfectly, I freeze the brownies still in the tin and then use a sharp knife dipped in hot water to cut picture-perfect. Sunny days and simple eating. After spending a month basking in the eternal sunlight of Vancouver, I think I understand what locals mean when they claim that people come to visit and end up moving here. I feel spoiled with the sunshine. The warm weather is always making me smile. I want to spend every last second out of doors. I’m not taking any of this for granted. I still remember the cold June days that made us wear layer upon layer of clothing just to run down to the grocers. The windy days in May. The rainy days in April – and all the grey. The alternate to sunshine in Vancouver is grey. It makes for some depressing times if you’re not yet quite used to it, so I’m welcoming and holding on to these sunny days as long as I can! This week I’m looking forward to some healthier eating as well as some barbeque dinners! It seems I’ve put on a few pounds this past month, after all that dieting in the spring I’ve been enjoying too much of a good thing! No cookies will be baked this week, much to the dismay of my Princess, but instead I will be trying to eat food in its purest form. Less cooking = more nutrients, and is much easier to prepare, right? For lunch today I made a simple tomato salad. I used a vine-ripened tomato, sliced and seeded, and arranged the slices on a plate. Chopped up some green onion and a couple of basil leaves, then drizzled with a small amount of olive oil and balsamic vinegar, and seasoned with salt and pepper. And it was delicious! It surprises me how little it takes to fill me up. I become accustomed to eating larger portions out at restaurants and then forget that I don’t necessarily need to eat more than my share of food, especially food that’s higher in fats or calories. I will be taking this week to think about what I’m eating, instead of just placing something in front of me and munching down on it. Wish me luck!